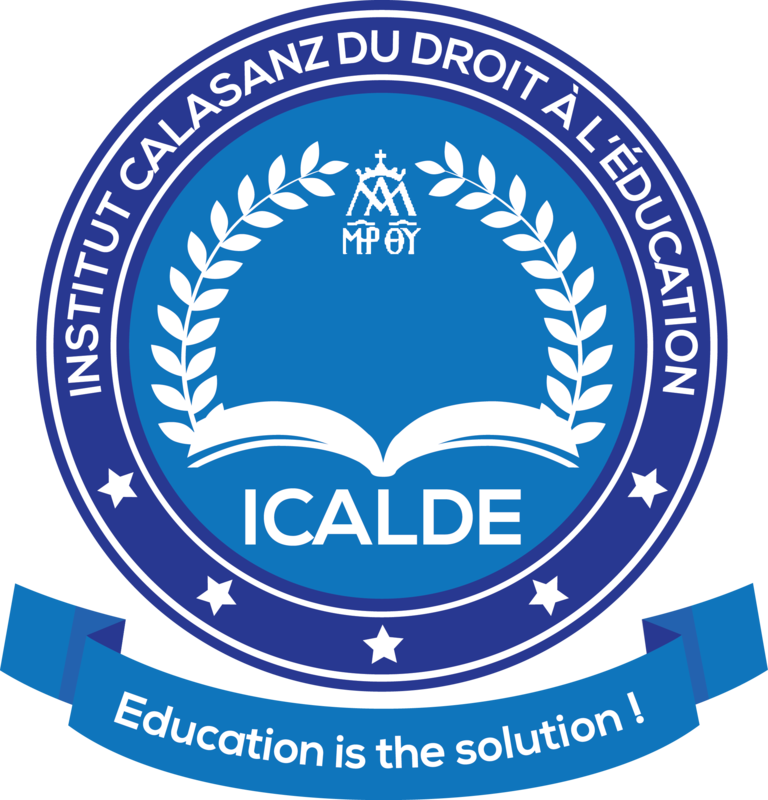 The CALASANZ Institute for the Right to Education (ICALDE) is an academic institution for training and research in strategies for the promotion and protection of the right to an integral and quality education for all. This initiative stems from the conviction that the reform of society necessarily involves quality education for all. Incorporating this belief, the Association BLAS in Africa, a work of the Order of Pious Schools, focuses on research and capacity building of civil society members on the right to education for all. Faced with social changes that bring about new educational challenges, the Association BLAS in Africa has resolved to promote and protect the right to an integral education for all by training people fully dedicated to achieving this goal. The aim is to involve community members in the process of awareness-raising and reform, in line with the UNESCO and UNICEF reports which recognize that «civil society organizations (…) have a crucial role in education, in particular that of compelling governments to be held accountable » and that « they can do so through their watchdog role in policy-making, monitoring and follow-up of budgets » . The report further stresses that “their involvement must extend to lobbying and education policies influencing as well as improvement of quality education that benefits everyone”. The creation of the Calasanz Institute of the Right to Education is the result of a renewed willingness and commitment to promote the right to education for all, as demonstrated by the Order of the Pious Schools on the occasion of its 47th General Chapter. It also testifies to the unwavering support of the Catholic Church in the struggle for the realization of the right to an integral education for all. The World Congress on Catholic Education (Rome, 2015) organized on the occasion of the 50th anniversary of the Declaration on Christian Education Gravissimum Educationis, as well as the 25th anniversary of the Apostolic Constitution Ex corde Ecclesiae on Catholic Universities, marked the turning point for the creation of ICALDE. These two major events helped building a cooperation network for the advancement of good practices and efficient actions in the face of new educational challenges. promote research and publication on education in general, and on Christian education in particular. ICALDE endows with skills and capabilities in Leadership, Advocacy and Lobbying. A unique combination that can raise people capable of investing strategic spheres of influence in order to better guide decision-making on education issues. Its innovative and bold approach effectively addresses the current challenges of inclusive education for all through the adoption of a new paradigm, as recommended in particular by the Incheon Declaration of May 2015. BLAS in Africa is the acronym of ‘Bring Light and Smile In Africa’ and is an association for the promotion and protection of the right to education for all. UNESCO-UNICEF, Make education a priority in the post-2015 development agenda. Report on the World Thematic Consultation on Education as part of the post-2015 development program, September 2013. In 1597, Saint Joseph Calasanz, founder of the Oder of Pious Schools, pioneer of education for all, created in Rome the first free popular school in Europe. LMD: Bachelor, Masters, Doctorate system of education. Education 2030: Towards Inclusive and Equitable Quality Education and Lifelong Learning for All.